Settling in: Guests enjoy President Claude Lajeunesse’s welcome cocktail party for new faculty. 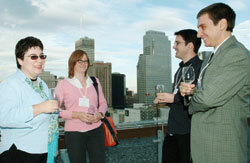 The Sept. 25 event was held in the reception area on the 11th floor of the EV Building. Here, enjoying the EV balcony (right to left) are Ciprian Alecsandru (Building Civil and Environmental Engineering), Xavier Ottenwaelder, Cerrie Rogers (both in Chemistry and Biochemistry), and Anca Alecsandru (Ciprian's wife). In the corporate world, managers understand that one of the main reasons staff leave is that they feel that their contributions are unacknowledged or that they are underappreciated. Arts and Science Dean David Graham knows that rewards may be different in the academic community, but people have the same reaction. “It’s important to remain attentive to a process of recognition and reward for members of the community for whom I have some measure of responsibility,” Dean Graham said in an interview over the summer. To that end, the first set of Dean’s Awards will be presented on Oct. 17. The winning teachers are Svetla Kamenova (Études françaises), Sara Weinberg (Education) and Shannon McSheffrey (History). To avoid the appearance of a popularity contest, Dean Graham made student evaluations only part of the assessment. He enlisted Associate Dean of Academic Programs Joanne Locke to accept nominations for the awards. Locke was part of a committee with three department chairs, each representing one part of the faculty: sciences, social sciences and humanities. All four received the full dossiers of all nominated candidates well before they met. Locke credits that preparation with facilitating what could have been an impossible task: comparing teaching chemistry with teaching communications or calculus. “We knew the files going in, and after having identified the criteria, we found we were really in agreement” on how to judge candidates, Locke said. Overall, she was impressed with the quality of candidates. Together with the committee, she expects to develop more consistent guidelines for preparing dossiers in the future. Dean Graham sees this as part of a larger initiative to ensure that Concordia’s community is recognized on the national and international levels. For instance, while the national 3M Teaching Awards are based on a variety of factors, “a key piece of evidence includes previous recognition at the institutional level.” Previous 3M teaching fellowship winner and current program coordinator Arshad Ahmad is a professor here at the John Molson School of Business. Each of the Dean’s Award winners will receive a certificate and $500 for research or professional development. Our mission “to develop and disseminate knowledge and values” can only be accomplished through our teachers. For more on teaching, click here.